3. Re-crown the barrel with an 11 degree counter-bore style crown. 5. Line bore Rings and bases and mount scope. 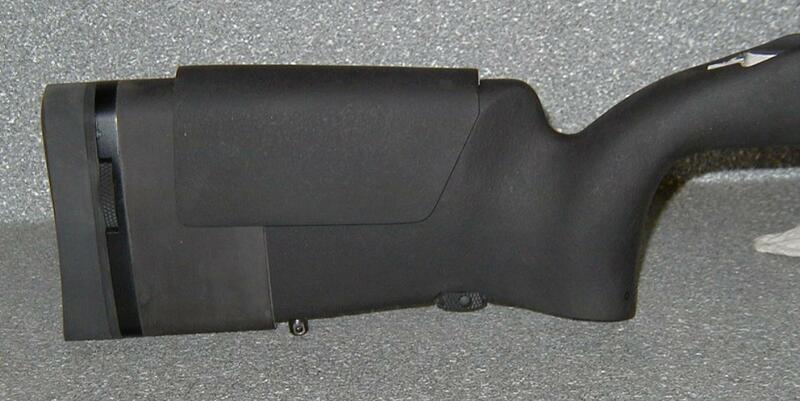 For Rifles with wood or synthetic stocks that can be aluminum pillar bedded. Level 2 Gives you that last bit of accuracy that can only be achieved with a match quality chamber and a perfect receiver barrel fit. The level 2 many times raises your rifle’s accuracy to that of a full blown custom rifle depending on barrel quality. 3. Remove original barrel thread extension. Rethread barrel to precisely fit receiver. 4. Re-cut chamber to match quality and polish. 1. Drill and re-tap Scope base holes to 8x40 for better alignment and more strength. 4. Badger 20 Minutes tapered rings and bases. 5. H-S Precision PST-25/26 stock vertical grip with adjustable Length of pull and adjustable comb. 6. H-S Precision PST03C stock vertical grip with adjustable Length of pull and adjustable comb. Depending on your needs we offer 2 levels of accurizing services to Remington 700 rifles. All Remington 700s fall into one of two categories light/sporter or heavy/target. The light/sporter models are confined to only level 1 (unless the barrel is replaced). Because the taper of the light/sporter barrel starts immediately at the recoil lug and tapers quickly to a sporter weight there is not enough barrel material to remove all of the original threads and cut new ones. The heavy/target models such as, but not limited to, the Sendero, VLS, VSF, or BDL Varmint are suited to both levels of our accurizing services. The best accuracy possible is everybody's goal. Our 29-point diagnostic is the straightest line to that goal. Many times the diagnostic process itself drastically enhances accuracy.. Each diagnostic begins by first measuring all critical tolerances such as the bore diameter, groove diameter and throat diameter and length. With the use of optical inspection equipment the condition of the bore’s surface is checked along with the condition of the barrels crown. Also important is the consistency of the bore diameter and consistency of the twist. Chamber casting will open windows onto any flaws or irregularities in the chamber and throat. After that the rifle is carefully disassembled. As the rifle is disassembled we look for anything that might impair accuracy, such as poorly torqued scope mount or guard screws or stress torqued into an assembly. Vibrations are the result of a lack of rigidity or from stress resulting from the poor relationship of a rifle's different components or subassemblies. Through the use of dial indicators these problems are identified and solutions can be recommended. Many times these problems are reduced or eliminated during reassembling. Some problems are not as easy. Poor chamber work can be devastating to good accuracy. The best match grade barrel and pillar bedded stock will never yield good accuracy if your chamber has a crooked, or over size throat. Each of the 29 points are checked or measured then given a grade of 1 to 5, 5 being perfect.